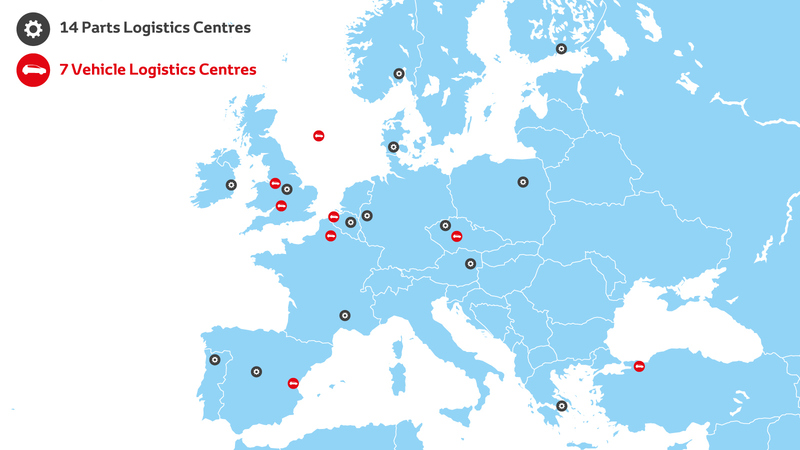 The Toyota Parts Centre Europe is our central distribution centre, at the heart of our parts supply chain. Located in Belgium, it ships thousands of parts every day to our regional depots across the region. The growth of our European manufacturing and sales means we have had to develop an efficient way of handling increasing numbers of parts – receiving them from our suppliers and shipping them to our workshops. This task is co-ordinated by the Toyota Parts Centre Europe, in Diest, Belgium. The centre was opened in 1992 and underwent significant expansion in 1999 and again in 2006, increasing its warehouse space from 38,000m2 to around 100,000m2. It is at the heart of a supply chain that also includes 17 regional depots in countries across greater Europe, from Portugal to Kazkhastan. TPCE stocks 205,000 different part numbers, received from 180 suppliers in up to 100 truck movements every day. It operates around the clock, shipping items to more than 40 destinations in 30 European countries. Our Environmental Policy helps us create an environmentally responsible business. TPCE is responsible for Total Supply Chain Management – that means it organises both when and how parts are received into the warehouses, the process by which they are selected, picked and loaded to meet orders, and the transport logistics required for shipping them efficiently to the right place, at the right time. The office part of the operation looks after matters such as procurement, inventory control, customer support, quality, packaging and planning. Meanwhile the team in the warehouse is responsible for receiving, sorting, storing, picking, packing and loading parts for shipment. On average, around 436,000 parts will be picked each day. The transportation of parts incurs significant costs and also contributes to the carbon emissions we produce as a business. That makes it an important area for identifying where and how we can make improvements to save money and protect the environment. The Toyota Parts Centre Europe focused on this issue, involving all its departments and European stakeholders in a thorough review. They concluded that valuable benefits could be gained from rethinking the way trucks are loaded, to make the best possible use of the space available. It is a “lean” solution to the problem, just like the principles we apply in the Toyota Production System Thanks to great teamwork, the project was rolled out to other facilities in our Parts Supply Chain Group so that they could take up new best practice methods. For example, our parts centre in Germany has already been able to save more than €350,000 a year by using boxes that can be returned, extending their lifetime. The new boxes are also designed with better ergonomics so they are easier to handle and allow for more efficient use of space. This means more parts can be loaded in each shipment, ultimately reducing the number of vehicle movements we have to make. And, of course having fewer trucks on the road means fewer emissions. These changes had an immediate impact for our supply chain group, in the first year alone saving almost 1.6 million tonnes of CO2. One of the biggest arrays of solar panels in Belgium can be found up on the roof of our warehouse at TPCE. Installed in 2010, it extends to 80,000m2 – the size of more than seven football pitches – and captures enough energy from the sun to meet up to 20 per cent of the site’s electricity requirements. We worked in close co-operation with specialist partner Blue Planet Solar NV, which financed and now operates the €7 million installation. The array is made up of 12,800 individual panels which together can produce peak power of 1.84 megawatts and up to 1,620 megawatt-hours of electricity a year. That gives TPCE the potential to save 1,700 tonnes of CO2 from its power demands each year. The performance of these panels contributes to the fact that all our facilities in Belgium have been 100% powered by green energy since 2007. This is in line with the targets we have set in the Toyota Environmental Challenge 2050 to cut the carbon emissions from our factories to zero. TPCE’s excellent environmental management standards earned the centre ISO14001 certification in 2001. It also carries out a programme of green activities to build awareness among its workforce and improve the quality of its site, such as tree planting. Toyota Olympic and Paralympic Partnership | Toyota Europe We’re incredibly proud to announce our partnership with the International Olympic Committee and the International Paralympic Committee until 2024. The Toyota Mirai: A start for the better Our world faces many challenges, with Mirai we are making a start for the better, to ensure that we can enjoy a future that cares about the environment. Recall As part of Toyota’s commitment to quality and safety, Toyota is expanding these recalls involving certain Takata airbag inflators in Toyota. At Toyota, the safety of our customers is our number one priority, which is why we continually monitor the performance of our vehicles through a number of sources. If we become aware of a certain component or aspect of our vehicles that doesn’t meet our strict standards we will take appropriate action, as we have done in this instance. Fuel Cell Technology Fuel cell vehicles (FCV’s) are powered by fuel cell stacks, which generate electricity from a reaction between hydrogen and oxygen from the air. Life Cycle Action From design, through to production, driving and recycling, we take into account everything we use and manufacture to see how it impacts the environment and our health, through a 360º approach called Life Cycle Thinking. The Recycling Process As a manufacturer of vehicles, it is hugely important that at the end of our product lives we have considered how to reduce their environmental impact.